It appears that there may be a serious bug with the "Reset All Settings" option in iOS 8, causing users who activate the feature to lose all of their iWork documents stored in iCloud Drive. According to multiple posters on the MacRumors forums, using the "Reset All Settings" option under General --> Reset has caused documents to be permanently deleted from iCloud Drive. Because iOS 8 was so sluggish on my iPad 3 I reset all settings (No data or media will be deleted) and sped it up BUT deleted my iWork data! Then promptly synced and deleted it in iCloud.I have public beta of Yosemite so can't roll back via time machine. I have no pre iOS 8 backups in iTunes or iCloud to revert to (well iCloud device backups don't contain cloud documents and I should have iOS 7 backups in iTunes but can't find any. iCloud has no trash like dropbox. They seem gone forever. 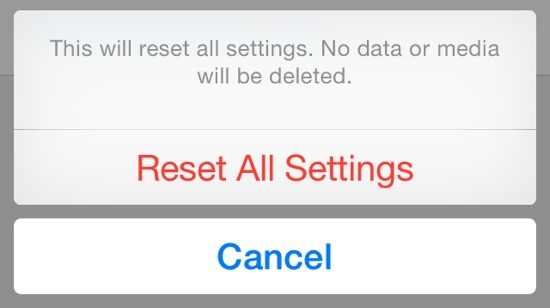 The "Reset All Settings" option explicitly says that "No data or media will be deleted," and it is meant to reset all user preferences to the default out-of-the-box settings. That the option is deleting iCloud Drive documents appears to be a serious bug, though it may be limited to Apple's own iWork apps like Pages, Keynote, and Numbers. One user had all of his iWork documents wiped by using "Reset All Settings," while other app information remained in iCloud. In our own testing, using "Reset All Settings" deleted all iWork documents stored in iCloud Drive on the iPhone and on iCloud.com. After allowing time for syncing to a Mac running OS X Yosemite, all of the documents disappeared from that machine as well. Preview and TextEdit documents, which cannot be accessed on the iPhone, remained untouched on the Mac. There appears to be no simple way to recover iCloud Drive documents that have been erased by "Reset All Settings" in Yosemite, and several people who have been affected by the bug are now in contact with Apple support in an effort to retrieve their documents. A Mavericks user was, however, able to recover his files from a backup folder, and OS X Yosemite users may also have luck with recovering files via Time Machine. Introduced with iOS 8 and OS X Yosemite, iCloud Drive is Apple's answer to cloud-based storage services like Dropbox. iCloud Drive allows users to store a variety of documents like spreadsheets, PDFs, images, and more, accessing them on any device. Currently OS X Mavericks users can access iCloud Drive documents via iCloud.com, but iCloud Drive will be fully functional in October, after OS X Yosemite is released. Users who have iCloud Drive enabled may want to refrain from using the "Reset All Settings" option on their devices for the time being, in order to avoid accidentally erasing important documents stored in iCloud Drive. What's going on with Apple lately? I would be screwed if I didn't read these forums so frequently. It's "you're" for "you are" not "your" for being possessive. What the hell happened to waiting to release stuff because "Details matter"? I know Apple wasn't perfect under Jobs but it wasn't this bad. The company seems too lax. Bendgate deniers will probably claim this doesn't happen either. show me a single video of a phone bending in front pockets, please. not just a bunch of dumbasses trying to break them on purpose. Strike .... 4? 3? Heh. I lost count.